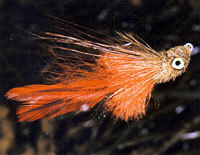 NINETY PERCENT or more of all saltwater flies are tied on some sort of “J” hook. Whether you purchase flies at your local fly shop or twist up your own creations, this is the standard used by most fly fishermen. Tiemco, Gamakatsu, Mustad, Eagle Claw, Daiichi, Dai-Riki, and Owner (to name a few) offer “J” hooks in a plethora of styles designed to hold the many different types of flies saltwater fly fishermen create. In the last seven to eight years, however, there has been a movement among salty brethren on the left coast toward tying saltwater flies on jig hooks — specifically, jig hooks with 60-degree bends. Now, this movement has grown and spread its way eastward, riding the buzz from a lot of anglers who believe that patterns tied on a 60-degree jig hook are superior. Eagle Claw EC413: This 60-degree hook is corrosion-resistant and has a longer shank design. Back in the late 1930s, hook manufacturers introduced the conventional fisherman’s bucktail jig, which was designed with a 90-degree bend on the shank just below the hook eye. The bend placed the hook eye on the same side as the hook point and allowed the hook to ride point-up in order to keep the jig from catching the bottom. To give weight to the hook, manufacturers added a molded lead head to the 90-degree bend. The lead gave the hooks the weight needed to be cast by a conventional-tackle fishermen. The bucktail jig was so effective that the US Army Air Corp included some fishing line and a bucktail jig in each pilot’s survival kit in case he was shot down over water. 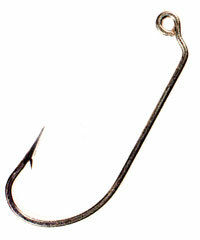 Mustad 3407: This is a typical "J" hook, the style commonly used for most saltwater fly tying. This lure revolutionized fishing for conventional-tackle anglers. And it had a huge impact on fly fishing, too. How revolutionary and important? Just ask Bob Clouser, creator of the Clouser Minnow. Though not tied on a jig hook, this deep-running pattern was created as a fly fisherman’s counterpart to the bucktail jig. It is unquestionably the single most important saltwater fly ever designed. Back in the late 1990s, a fly fisherman out of Texas named George Glazener introduced the Spinster, a fly tied on a jig hook. Glazener said he had been dressing patterns on jig hooks since the 1970s and had been developing and fishing the Spinster since the 1980s. To my knowledge, it’s the first pattern designed specifically with a jig hook. “I developed the Spinster when I began fishing for Lake Texoma stripers and needed a fly to do what the Stump Jumper did for the conventional-tackle fishermen,” Glazener says. Fly-fishing authority, writer, fly tier, and fishing guide Dan Blanton fished with Glazener in May of 1999. Blanton prodded Glazener to go public with the Spinster, and Glazener did. 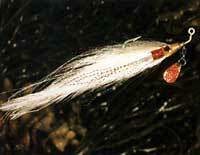 And since that trip, Blanton has single-handedly popularized tying flies on jig hooks. He reinvented already-proven patterns by tying his Whistler and Sar-Mul-Mac on 60-degree jig hooks. His latest creation is a flashtail Clouser tied fully dressed on a 60-degree jig hook. Blanton prefers to tie his flies on the Eagle Claw 413 jig hook in sizes 2/0 through 2. He rarely fishes “J” hooks anymore. Another plus is that flies tied on jig hooks ride point up and require less weight to do so consistently than flies tied on conventional “J” hooks. Less weight means a softer landing, which gives shallow water fisherman a big advantage that should translate into fewer spooked fish. The hook with the 60-degree bend also has better hook-setting power, and it has become more popular in many fishing circles than the 90-degree hook. 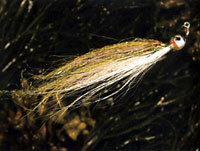 According to Blanton, bottom-crawling shrimp and crab flies tied on 60-degree jig hooks ride over obstructions incredibly well and are almost weedless. 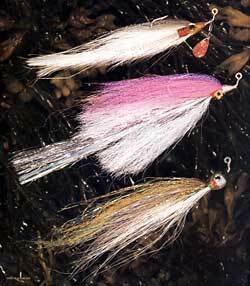 Nowadays, Blanton ties all his Merkin crabs on jig hooks. Gary Merriman, owner of The Fish Hawk fly-fishing shop in Atlanta and one of the best skinny-water fishermen in the country, agrees. “It has been my experience that flies tied on bendback hooks decrease the number of my hookups,” he says. I have been playing with jig hooks for the past year or two and have had a great deal of success with a fly that I named the Jig’s Up. It is nothing more than an epoxy-style Surf Candy (popularized by Bob Popovics) tied onto a Mustad Ultra Point 32786BI N 60-degree jig hook. It is very similar in appearance to West Coast tier Dave Sellers’s SST (Sellers’s Striper Teaser), which incorporates a rear weighting system that makes the fly dart from side to side when retrieved quickly. While the SST is an excellent pattern, it takes quite a bit more time to tie than the Jig’s Up and uses much more epoxy. I tie the Jig’s Up with the Mustad jig hook instead of the Eagle Claw (EC413) for a number of reasons. First, the hook gap is wider than that of the typical O’Shaughnessy style EC413, and I believe the difference translates into more hookups. Second, the Mustad hook uses a heavier gauge wire that allows me to tie flies in smaller sizes without worrying that the hook will open up. It also has a shorter shank, which I believe decreases the chance of the hook working itself free. The Jig’s Up is especially good in skinny water. It is dressed with a very light coat of epoxy over EZ-Body Braid (which shapes the head and body), so it makes little disturbance when it hits the water. The pattern also rides hook up, every time. It has been extremely successful when fished with a slow retrieve in Florida for both redfish and snook as well as on stripers in the flats of the Northeast. Capt. Jeff Smith of Fin Addiction Charters, out of Wellfleet, Massachusetts, has a couple of excellent patterns that incorporate 60-degree-bend jig hooks. His WDA (Well Diggers Arse) bears a close resemblance to Bob Popovics’s Jiggy, but upon closer inspection, you will find that the WDA is tied fuller, is heavily dressed with flash, and employs a craft bead along with a tungsten cone to give the fly a bigger look at the head. Smith says this fly was designed to catch striped bass off the outer beaches of Cape Cod, and he prefers to fish the pattern with a long strip and a definite pause. “The fish will always hit this fly during the pause,” he says. Mustad 32786BLN: Another 60-degree jig style hook but with a wider gap and perfect-bend design. While the Jiggy was certainly the inspiration for Smith’s pattern, he claims that the jig hook gives him all the same advantages Blanton discussed above. Smith said this pattern can be tied from sizes 2 to 3/0. When tied in different color combinations this fly has also taken redfish in the back country of North Carolina’s Outer Banks. Tiemco 411S Bendback: hooks such as this are popular because they ride point-up. In Pop Fleyes, Popovics states that the creation of a fly should be based on a specific need or a problem. Flies tied on jig hooks help solve several basic problems commonly encountered by fly fishermen: losing fish due to barbless hooks, spooking fish, and wasting opportunities due to obstruction. It was George Glazener’s creativity and Dan Blanton’s vision to recognize the advantages of jig hooks that has made dressing patterns on these hooks popular. Today, fly fishermen traveling to any saltwater destination around the world should have a few jig hook patterns, even slightly modified versions of some of the best and classic saltwater patterns ever designed, mixed into their fly arsenal.